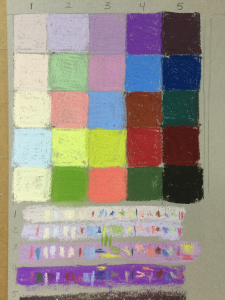 On Tuesday, we continued with our pastel class focusing on Color Confidence. We played with neutral colors plus saw how analogous colors worked compared to complementary colors. At the store where I work, we had a gouache artist present a demo in the spring. She believed it was important artists create their own color wheels to fully understand and appreciate how colors work. I remember learning about the color wheel in school but I don’t specifically recall mixing pigments to learn about color. 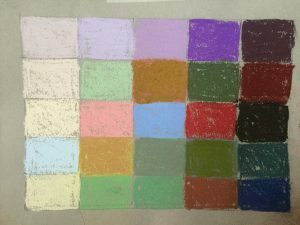 In college, the teacher in one of my first art classes had his students use colored pages in regards to color theory. I’ll have to think about his reasoning for it but I remember we used these pages during the semester in various exercises. I don’t recall any classes after that point where we spent time discussing color theory by mixing colors. I feel I may have missed something by not mixing pigments. I’m glad the subject matter for this month’s class is Color Confidence. 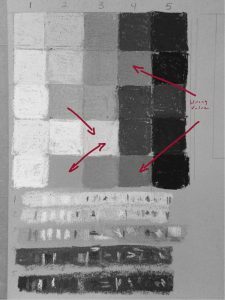 During the first two classes, I learned a lot about mixing neutrals and how they can be used to make colors around them stand out. These exercises will be very beneficial as I continue with my art. Well, it’s not perfect but much better. When viewing the black and white photograph of the study you can see I’m still not quite there but much better than my first try (See previous post http://cynthiarodday.com/blog/2017/10/03/its-so-good-because-its-so-bad/ for first attempt). I think one thing is certain from this exercise. I need to work on determining mid-tones values. Ultimately, I should purchase a few mid-tones of various colors. Do those colors work? 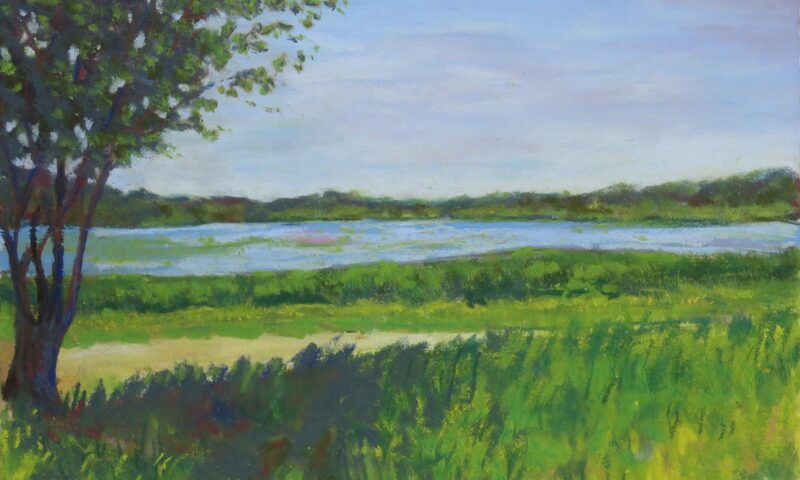 This scene depicts pine trees along a small lake. In the reflection you see the trees as well as the sky. 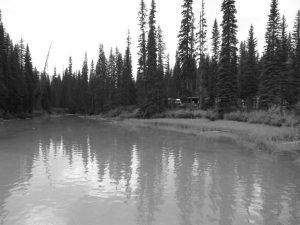 Here’s the original black and white photograph. Tell me does the colors from the Value Study work? It’s So Good because it’s So Bad! What’s wrong with this photo? It’s So Good because it’s So Bad…. 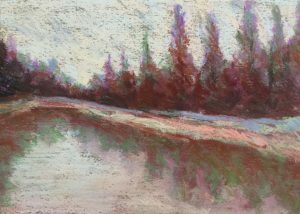 We are discussing Color Confidence in our OctoberPastel Class. 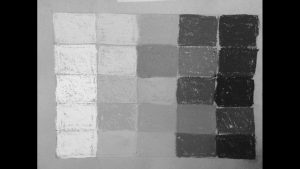 Over the next few weeks, we are doing exercises dealing with value (light vs dark), chroma (bright vs dull) and temperature (warm vs cool). Our first exercise would really hit home the idea that while color gets all the glory, value does all the work! First we were tasked with picking out one hue in varying values. In my values photo, the top row showcases a violet hue ranging from lightest to darkest on a scale of 1 to 5. The thought process is in painting it does not matter the color you use as long as it matches in value. If you have the correct value, the color will work in the painting. In the other rows we were asked to pick colors matching them to their corresponding value. It’s more difficult than you’d think! There were a number of times, I found a color that I thought could be a two or a three value and took a chance in placing it in squares of the exercise. When I completed study, I took a photo of the piece and converted it to black and white. Here’s where you can see the mistakes. That’s why I say it’s So Good because it’s So Bad. Obviously, I’ll correct the value study. The more I work on it, the better I’ll become at determine values and picking colors that will work cohesively in an artwork. Sometimes the best way to learn is to make mistakes. Is an artwork ever finished? New Value Study – Cynthia Rodday on It’s So Good because it’s So Bad!